These Rules and Regulations define the subject-matter of provision of services, liability and rules for staying on the Hotel’s premises and form an integral part of the contract executed through the signing of the guest registration card and also through performance of implied acts, in particular booking of a room and/or payment of a deposit or the full amount due for stay at the Hotel. When carrying out the acts listed in the preceding sentence, the Guest acknowledges that they have read and accepted the provisions of these Rules and Regulations. The Rules and Regulations apply to all persons staying at Hotel SPA Dr Irena Eris Wzgórza Dylewskie. The Rules and Regulations can be found at the Hotel’s reception desk and on the Hotel’s website. Guests are kindly requested to contact the Hotel’s reception desk, ext. 100, for inquiries or assistance. Hotel rooms are booked for hotel nights. A hotel night in rooms starts at 2.00 p.m. and ends at 11.00 a.m. on the following day. Guests may request extension of their hotel stay beyond the period declared on arrival and the Hotel will grant their request subject to availability of rooms. The Hotel reserves the right to refuse extension of the Guest’s stay at the Hotel if the Guest has previously failed to make full payment for the original length of their stay at the Hotel or has breached these Rules and Regulations. If the Guest has not specified the length of their stay at the Hotel, it is assumed that the room has been booked for one hotel night. Registration at the Hotel is based on the Guest producing their identity document with a photo at the Hotel’s reception desk and signing the guest registration card. Guests of the Hotel cannot hand their rooms to other persons even if the period for which the Guests have paid the amount due for their stay has not lapsed. Persons not registered at the Hotel may stay, as visitors, in hotel rooms from 7.00 a.m. until 10.00 p.m. The Hotel may refuse to accept any Guest who has committed a gross breach of these Rules and Regulations on the occasion of his or her previous stay at the Hotel, in particular by damaging the property of the Hotel or other Guests or causing bodily injury to other Guests, Hotel’s staff or other persons present on the Hotel’s premises. The Hotel reserves the right to block balances on the credit card made available by the Guest for the booking purposes corresponding to the amount due to the Guest’s full stay at the Hotel, and the Guest hereby authorises the Hotel’s reception desk staff to charge the Guest’s credit card with the amount due to the Hotel. Once the balance in the Guest’s account has exceeded 10,000 zł, the Guest is obliged to settle such balance on the same day. Otherwise, the Guest’s continued stay at the Hotel will not be possible. In the event of the Guest’s renouncement from stay at the Hotel during the hotel night, the Hotel will not reimburse the Guest for the amount due for the commenced hotel night. The Guest will be charged for cutting their stay at the Hotel short with an amount equal to 50% of the value of the unused hotel nights. The Guest consents to issuance of VAT invoices without the Guest’s signature. The Hotel provides services consistent with its rating and standard. Guests are kindly requested to lodge any complaints relating to quality of services at the Hotel’s reception desk without delay so as to enable the Hotel’s staff to respond swiftly and improve the standard of provided services. technically efficient service and, in the case of breakdowns that cannot be fixed without delay, the Hotel will use its best efforts to transfer the Guest to another room, subject to availability of rooms, or otherwise mitigate the inconvenience. the SPA Centre during its opening hours, i.e. from 7.00 a.m. until 10.00 p.m.
At the request of any Guest staying at the Hotel with a small child(ren), a baby cot(s) and other amenities facilitating care over the child(ren) will be placed in the room free of charge. The Hotel’s fittings and fixtures or technical equipment caused by the children under their care. Hotel Guests assume full financial liability for any type of damage to or destruction of the Hotel’s fittings and fixtures or technical equipment caused through the fault of the Guest or persons paying a visit to the Guest or persons paying a visit to the latter. The Hotel reserves the right to charge the Guest’s credit card for any damage caused, after the Guest’s departure. Accordingly, the Guest hereby authorises the Hotel’s reception desk staff to charge their credit card with the amount due to the Hotel. In the event of a breach of the provisions of these Rules and Regulations, the Hotel may refuse to provide the services to the person breaching the Rules and Regulations. Such person is obliged to comply with the Hotel’s demands without delay, settle the amounts due for the services already provided by the Hotel, pay for any damage caused and to leave the Hotel. When leaving his or her hotel room, the Guest will make sure each time that the door and windows are locked and closed, respectively. The Hotel has the statutory right to establish a pledge on the items brought into the Hotel by the Guest in the case of the Guest’s delay in settlement of the amount due for the stay at the Hotel or failure to settle the amount due for the provided services. 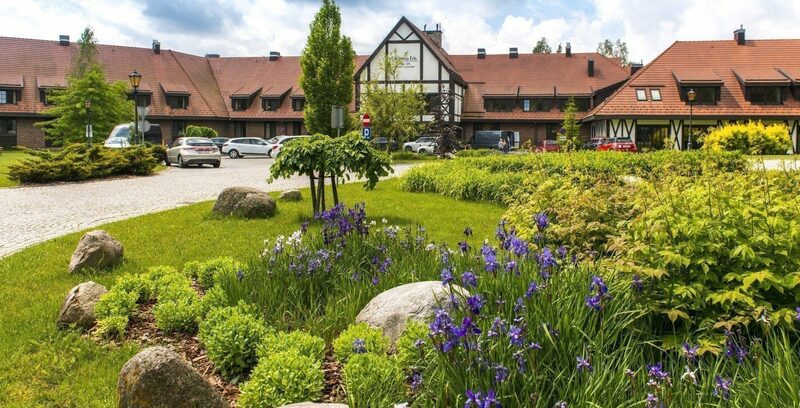 The Hotel is liable for any loss of or damage to the items brought in by the persons using the Hotel’s facilities to the extent outlined in the Polish Civil Code. Guests should advise the Hotel’s reception desk of any damage immediately after becoming aware thereof. The Hotel shall be liable for loss of or damage to cash, securities, valuables or items of scientific or artistic value exclusively if the said items have been placed in deposit at the Hotel’s reception desk. The Hotel reserves the right to refuse acceptance into deposit of the items of great value or large amounts of cash that cannot be stored in the Hotel’s deposit. The Hotel is not liable for any damage to or loss of a car or other vehicle belonging to the Guest, items or live animals left inside such car or vehicle, regardless of whether or not such car or vehicle was parked in the Hotel’s underground car park or in the car park outside the Hotel’s front or in its surroundings. Personal belongings left by departing Guests in the hotel room will be returned to the address designated by the Guest, at the Guest’s expense. In the absence of any instructions to that effect, the Hotel will store the aforesaid items at the owner’s expense over a period of twelve months and, following the lapse of that period, ownership of such items will pass to the Hotel. Foodstuffs will be stored for a period of 24 hours owing to their properties. Night quiet time at the Hotel starts at 10.00 p.m. and ends at 7.00 a.m. on the following day. Guests have the right to lodge complaints upon identificationof any shortcomings in the quality of the services provided by the Hotel. Any and all complaints are to be lodged with the Hotel’s reception desk. Complaints will be lodged without delay after identification of shortcomings in the standard of the services provided by the Hotel. Additionally, having regard to Article 32.1.2 of the Act on Out-of-Court Resolution of Consumer Disputes of 23 September 2016 (Journal of Laws of 2016, item 1823), Hotel SPA Dr Irena Eris Wzgórza Dylewskie Sp. z o.o. with its registered office in Polanica-Zdrój hereby declares that it does not agree to participate in any proceedings concerning out-of-court resolution of consumer disputes. No animals will be admitted into the Hotel. A strict ban on smoking is in force at the Hotel, with the exception of the dedicated smoking area in Café Fifka. No hazardous loads, firearms, ammunition, flammable materials, explosives or illuminating materials may be stored in hotel rooms. Guests consent to the processing and storage of personal data in compliance with the Personal Data Protection Act (consolidated text in Journal of Laws of 2002, No. 101, item 926, as amended) by Hotel SPA Dr Irena Eris Wzgórza Dylewskie Sp. z o.o. for the purposes of arrangement of the Guests’ stay at the Hotel and the Guests’ use of the remaining services provided by the Hotel. The Guests have the right to access and correct their personal data. Marketing and door-to-door selling as well as any games of chance are prohibited on the Hotel’s premises. Guests undertake not to cause, and the Hotel will not permit, excessive noise levels on the Hotel’s premises or unpleasant smells escaping from the hotel room, or otherwise disturb, inconvenience or upset the remaining Guests of the Hotel. Other than minor moving of furniture and equipment without compromising their functionality or safe use, the Guests must not make any alterations to their hotel rooms and equipment. Hotel Guests must not use any devices or items likely to give rise to the risk of damage to the property of the Hotel and other Guests, in particular devices with a potential to cause a fire or flooding. Use of kettles and other devices constituting standard equipment of hotel rooms is acceptable. The court having jurisdiction over the respondent is competent to settle any disputes between the Guest and the Hotel. Management of Hotel SPA Dr Irena Eris Wzgórza Dylewskie.